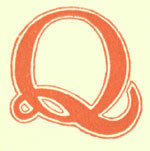 I was in a bit of a quandary about what to do for the letter "Q"
My husband is so funny sometimes. He has these little quirks things he does and says all weather related. He'll start by saying, "bad weather is coming." Followed by, " my body is aching and my back hurts." We'll go to the grocery store to get all we need because that's one of his quirks like I said. This weather thing includes products too. He has radios, batteries, flash lights, candles all types of bad weather goodies just in case. He can tell when bad weather is coming and his body doesn't get it wrong like those people on the TV. So my "Q" is the word quirk and a question. So dear readers, are you like Bill? Can your body predict the weather? And if so what happens to you? Don't miss my next blog post. Both are located on the left sidebar. Sometimes it is. This year it predicted the pollen count was high and since I was a little run down, it got me good! I wonder why they love the weather so much?! My feet let me know when it is cold. Does that count? Ha, I haven't noticed anything like this in myself, but my mum's nose does tend to be quite good at detecting when the weather is gonna be cold! I'm glad it's only her nose, lol! No, my body cannot...but my cats' bodies can! yep...my knees hurt before the weather is about tho change. It's like lliving with your own meteorologist! This is a good quirk to have. I think you're right Maria the key to this pain/weather thing and all the other quirks we feel is most probably aging. A-Z 2013 the letter "B"
A-Z 2013 the letter "A"